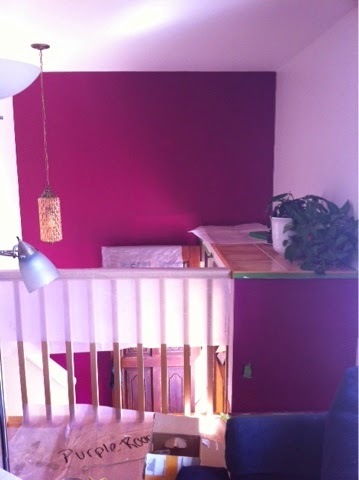 But I did learn a few things from painting the interior of my house, and I am happy to share them with you. 1. The preparation and restoration takes about 80 percent of the total project time. This means moving stuff around, patching, sanding, removing hardware, and masking. Once you get to the 20 percent--the painting--it feels great! But be sure you save some energy for the unprep work: removing tape, putting away the drop cloths, vacuuming up all the bits of paint and dust, and reinstalling your drapery hardware, shelving brackets, lightswitch and outlet covers, and picture-hanging hardware. Oh, and moving all your stuff back into place. 2. Coverage: If the can says the paint will cover 350-400 square feet, it probably will. Barely. Don't assume you can stretch it. Even if you add water to thin your paint, as when applying paint using a compressor-powered paint sprayer instead of brushes and rollers, you only add a small amount of water (1 part water to 32 parts paint). So estimate conservatively or suffer the consequences: your paint won't cover, and you'll certainly need two or three coats--more time. 3. "Do not overwork" is one of the instructions on the side of the bucket of spackling paste I went through in doing this project. It applies to painting, and lots of other activities, too. Before your drywall putty or paint is starting to dry, you want to get your final smoothing strokes in with your putty knife or damp finger, or with your brush. Or you'll end up with a bumpy surface that attracts dust and dirt over time. 4. Be patient. It may take a couple of passes to get it right. I patched several places on walls and doorframes that required more than one application of putty to fill the dents. And when I painted our accent walls, I ended up going over every edge that butted against a contrasting color with a 3/4"-wide art brush to get the edges to look sharp. I couldn't mask the edges because our walls have too much texture--the paint would have seeped under the masking tape. So it was worth going over each edge, but it took time, especially for the bits that required the 20' extension ladder. 5. Get the right tools for the job. After painting a couple of rooms with a roller that kept pushing the roller cover off as I worked my way around the room, I went to the hardware store and found one that cost $6 and had an easy-to-use extender. Not only did it keep the roller covers on throughout the project, it also saved me unnecessary trips up and down a stepstool to paint the higher parts of the wall. Another cool product I learned of is Ramboard, a sturdy cardboard that protected our newly refinished wood floors from the insults of the bathroom-remodeling process, and then we kept it around a little longer for the interior painting project. It really helped. 7. A corrolary of #6 is: Your equipment won't necessarily last forever. Brushes last pretty well, Most roller covers I've found can't be used for more than a few rooms before you need a fresh one. 8. Do the work in order. Clear stuff out of the path and away from all walls. Remove hardware (lightswitch and outlet covers) and tape over the outlets and switches if you tend to slop paint around like I do when I'm working at a fast pace. Scrape, patch, and sand, and then vacuum up the dust before you start taping. Tape off woodwork, light fixtures, and contrasting walls (if the walls don't have a lot of texturing). Paint from one side of the room to the other and from the top of the wall down, so you know what you have already done and where you still need to paint if you have to stop in the middle to answer the phone or the door. Wait for the paint to dry completely (see the instructions on the paint can) before applying more paint or replacing the hardware on newly painted surfaces. Once you've done all that work, you are rewarded for years by beautiful, fresh walls, in any color you like. For me it's worth the trouble.